The Israeli Authorities have decided, on Monday evening, to close Karem Abu Salem (Kerem Shalom) crossing, and to reduce the fishing zone allotted for the Palestinians in Gaza, from six to only three nautical miles. Engineer Raed Fattouh, the chairman of the coordination committee for the entry of goods into the Gaza Strip, said the Israeli side has officially informed the Palestinians that it is closing Karem Abu Salem Crossing, which is used for the entry of goods into the coastal region, until further notice. Fattouh added that Israel cited “security considerations” for shutting the crossing down, and said that only limited types of food supply, and medicine, will be allowed through. The decision came only one week after Israel decided to significantly decrease the amount of goods, food and medicine entering the Gaza Strip, as one of the measures meant to pressure the Palestinians into halting the Great Return March processions. 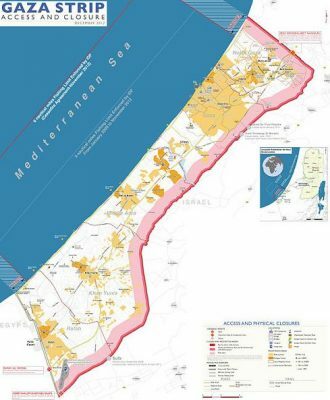 It is worth mentioning that, under the Oslo Peace Agreement, signed between Israel and the Palestine Liberation Organization in 1993, the fishing zone was set at twenty nautical miles, where the Palestinians are supposed to be able to fish and sail, but Israel kept violating the agreement.